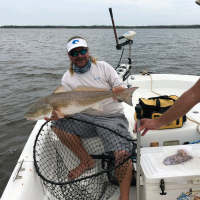 Rare Gulf of Mexico Catch !! I’ve been fishing in the Gulf of Mexico for a long time and I have never even heard of one of these being caught, much less on my boat. With the wind honkin at 20 knots out of the north east, fishing options were limited. I have a little spot in the Gulf in Englewood that usually holds decent flounder and mangs this time of year and at only 25 ft deep, it was the perfect choice for a windy day. We loaded the live well with 5 dozen shrimp, plenty of chum and cut bait and anchored up. We bagged several very fat flounder, a couple decent mangs, a few nice sheepies and a couple reef sharks in just a couple hours. At about 12:30, the wind shifted more out of the east/southeast, causing me to re-anchor and reposition the boat. Soon after we get set back up, my fishing buddy Ekim yells out, “what the *&^ is that behind the boat?” I look just under the motors and I see a very large shape that looks like a shark. The coloring on it is really weird because I initially took the shark to be a Mako. Having caught a few of them and one over 400 lbs in the Gulf this past spring, I can’t forget that color. For whatever reason today, I thought it would be fun to mess around with some Goliath grouper. I had brought along a 50 wide Shimano with a 280 lb wind-on and several 12/0 circle hooks. A wise man once told me that success is the sum total of preparation meeting opportunity. Today, it came together. We throw on a large chunk bait and drop it straight down where I last saw the blue missile. Within 10 seconds, I feel the pick up and start feeding it. After a few seconds, I slowly engage the reel and the big rod doubles over. At first, the shark did not run, and it hovered about 4 feet down along side my boat. 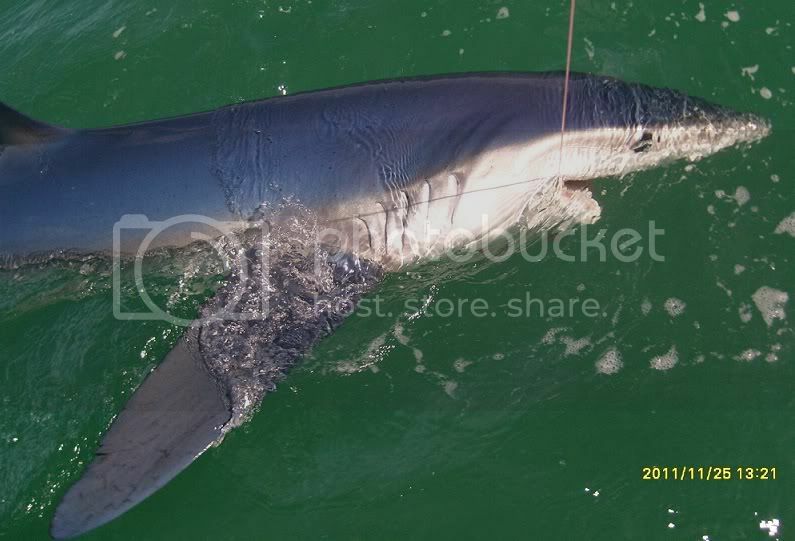 I got a closer look at the cobalt blue back and I was certain we hooked into a big Mako. I was kind of concerned because the shark was very close to the boat and I don’t think he realized there was a problem yet. The last thing I wanted was a pissed off Mako jumping into the boat. Well, the fight goes on as reasonably expected, especially when the shark takes me around two crab floats. For whatever reason, it reverses course and swims in the opposite direction. Lucky again ! After 20 minutes or so, we get it up to the boat to get a better look at the absolutely beautiful blue back. It really stood out in the very green water. 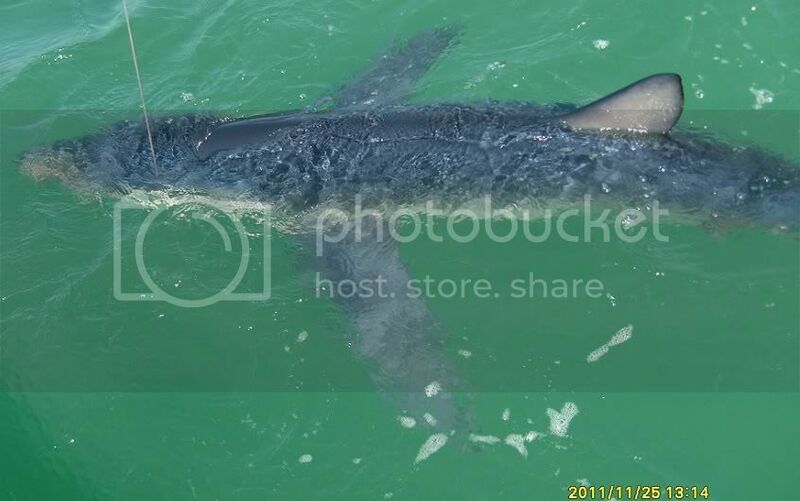 We are confident we have a Mako at this point until it gets close enough to see the pec fins. Big and wide. A Blue Shark !! Never caught one in the Gulf. Extremely beautiful creature. We took a few pics and some video and then cut the fish free. It was every bit of 8 ft long. Caught in 25 ft of very Green water off Englewood. You just NEVER know ! I hope the video comes out here. Outstanding Kevin. Love the photo with the beach in the back ground. I'm interested to hear if any other have been caught in the area. Gorgeous fish. Congrats on a rare catch. Nice Work. That guy must be lost?? That sure is an interesting catch! Congrats! very nice man. i so badly want to catch a mako and you got one in 25 feet of water. That's a new one on me Kevin. Congrats on an extremely rare catch! Thx guys. I have a call into Mote Marine to see if they have any insight into the frequency of Blue sharks in the Gulf. Nobody that I have talked to has ever heard of one, especially in only 25 ft of green water. I'll post any response I get from them. Nice Catch! Great video too! Thx Bobby. Glad to see you on here. Hope all is well. When you spend a lot of time on the water in the Gulf & keep your eyes open there are all kinds of different things out there. I' ve seen schools of Whale Sharks when they say there aren't any around here. Tigers & Makos within a couple miles of shore, as well as several other surprising sights, but never a Blue Shark. 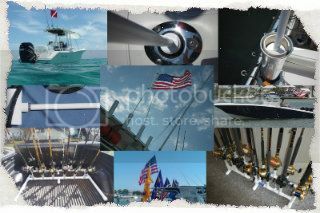 Great photos & report! Thank you. Thx Remy. Yes, I've seen my fair share of odd sights while out on th water, but this catch stands out. Hopefully I will hear back from Mote today. Heard beack from Dr Bob Heuter from Mote Marine. He was quite surprised at the catch. Says it was a female Blue shark. He says they are caught from time to time in the Gulf by commercial long-liners, but never that close to shore. He couldn't explain it as the shark appeared healthy and was obviously hungry. He also told me that the specimen samples from my 424 lb Mako I provided to Mote back in the spring went to some great scientific discoveries with regard to shark skin research. The published several papers and gave us credit in the research for providing the skin samples. Here is a pic of that fish. It was caught about 80 miles off Boca Grande back in March. 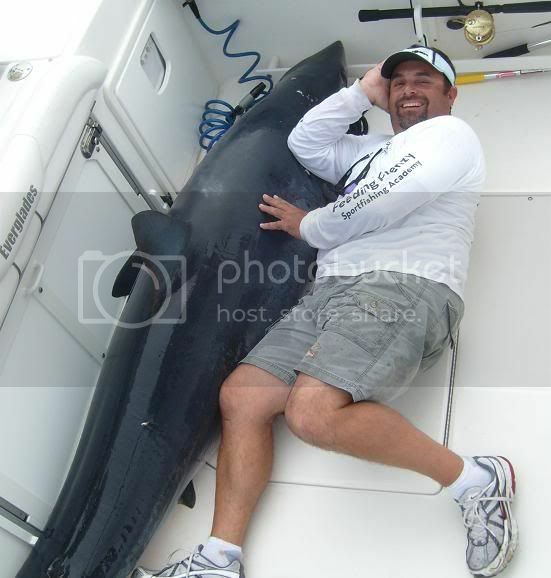 How the heck did you get that beast in the boat? Did you kill it first or bring in on board alive? I wanna be like you when I grow up! That is one big ugly SOB! HAAAAAAAAAAAAAAAAAAAAAAAAA Good one Chris. Made me laugh ! Im sure the Mercury level was sky high in this guy, but every scrap was eaten. Great story , awesome pics ! You can be sure that mako was not brought onboard alive!!! 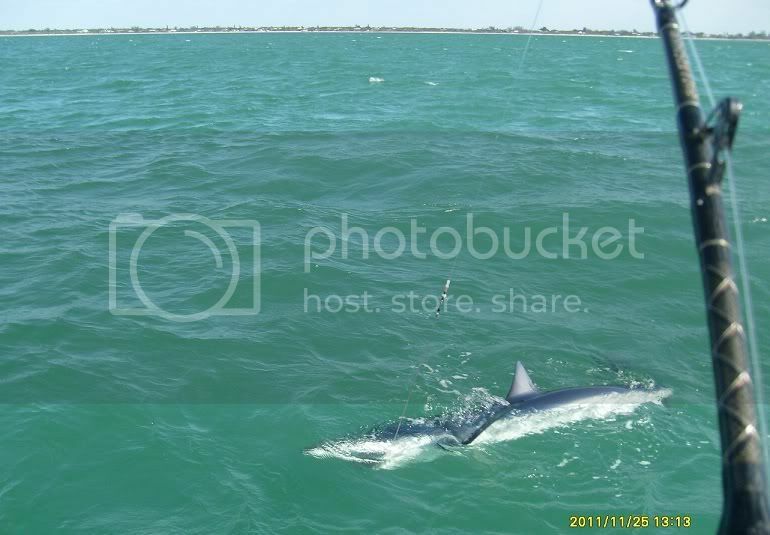 I remember about 7 years ago, maybe longer, some tourists from the MidAtlantic, fishing off Marathon brought a LIVE mako, onboard. If I remember right, it was just over 300#. The boat, a rental, was trashed, even the center console was busted off. Fishermen ended up in the water to escape the shark, until another boat came along to tow them in. Made the 5 oclock news in Miami!!! In New England, the blue dogs are the scourge of the tuna/sword fishermen.